I was contacted in mid-September by representatives for the Washington State Fruit Commission. 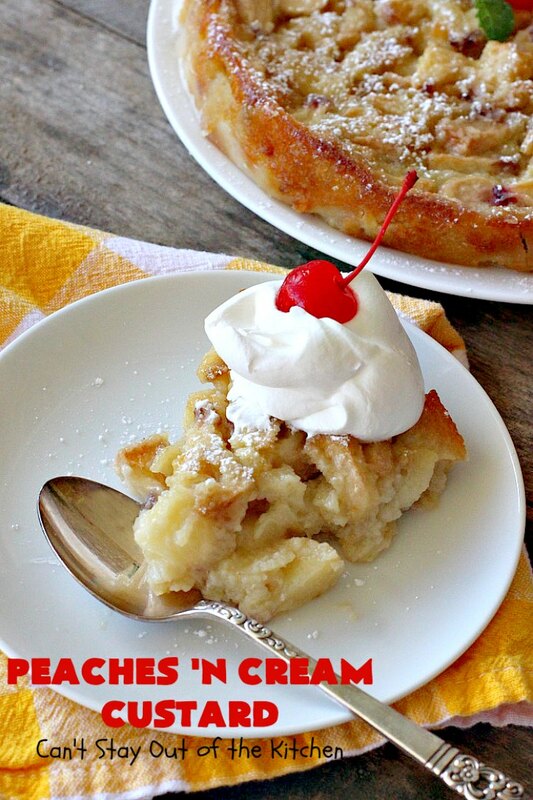 They asked me to consider blogging about either white flesh peaches or nectarines. I knew I could not do justice to another 20-pound box of fruit. So I told them I would do a ten-pound box of nectarines….I received a ten-pound box of white flesh peaches instead! They have them automatically shipped in 20-pound boxes so they had to make a special order for me. I was glad they did because those white flesh peaches were absolutely delicious. 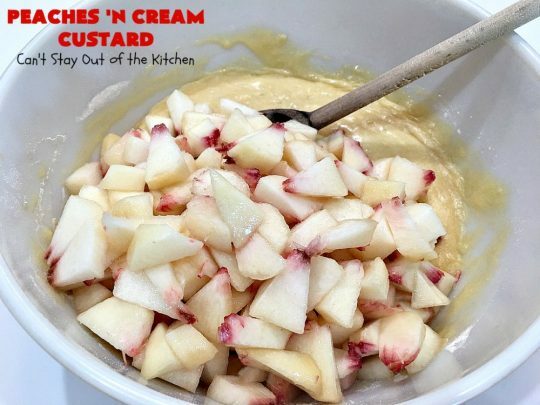 I made two different desserts with them. 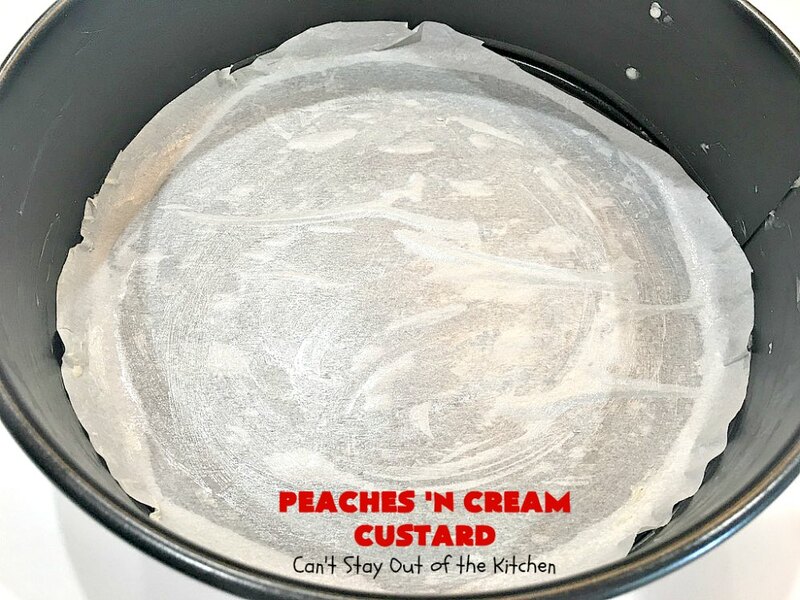 I made this Peaches ‘n Cream Custard (because it used up so many of the peaches). I also made five or six Rustic Peach Galettes. My plan was to use up all the peaches and post before peaches disappeared from all the supermarkets. 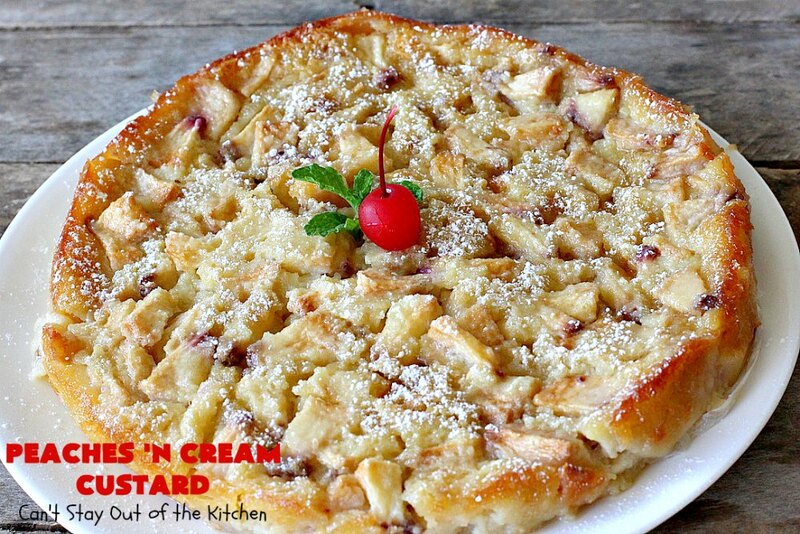 This turned out to be a really fantastic dessert. But let me forewarn you: if you’re looking for “cake” you’re not going to get it in this recipe. This is a custard–almost pudding type recipe. It’s not a cake. If you want cake, you’ll have to add an additional cup or cup and a half of flour to give it the body and texture needed. I made this in a springform pan because that’s what the original recipe suggested. 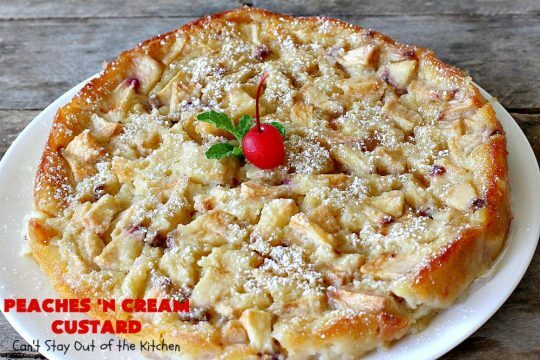 But you can just as easily bake this in a round cake pan. 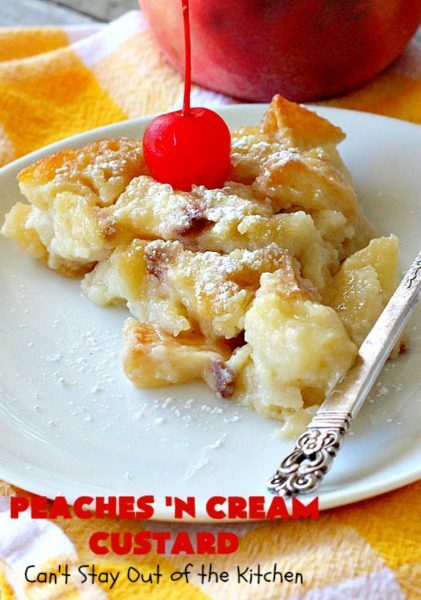 This lovely, fruity dessert is excellent made with fresh peaches. But I think you could just as easily use canned or frozen peaches for the recipe as well. 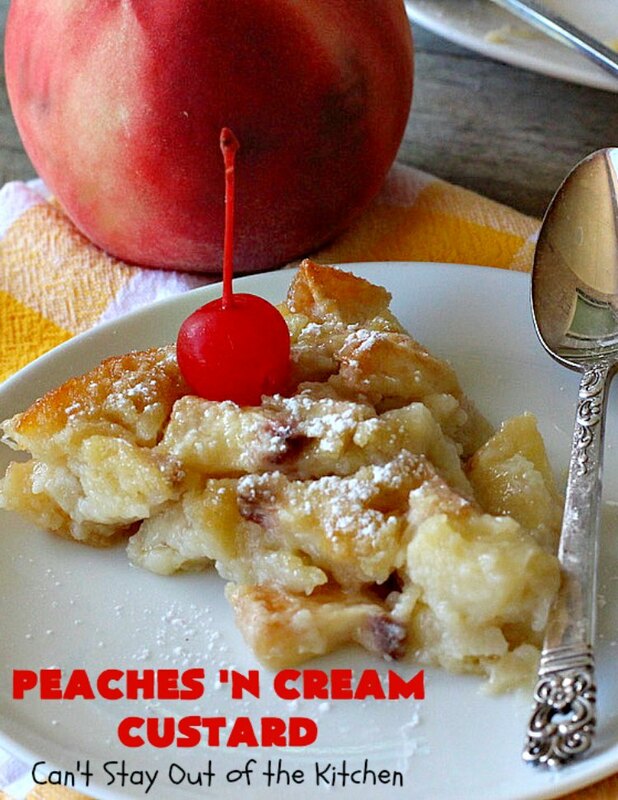 If you’ve never tried white flesh peaches before, they are incredibly scrumptious in this recipe. If you want to sample a dessert that you don’t feel horribly guilty after eating, this is the one for you! Enjoy. 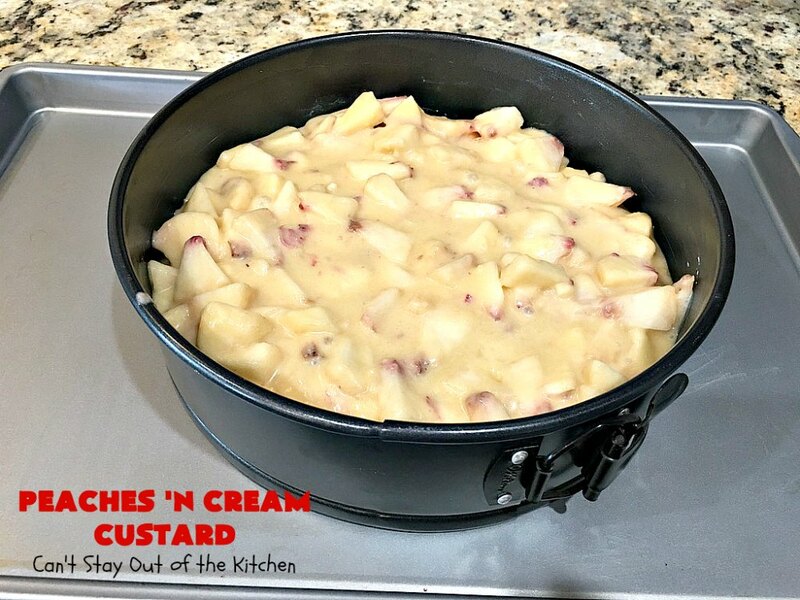 Peaches ‘n Cream Custard is a light, fluffy and fruit dessert. This is a perfect after dinner dessert when you don’t want an extremely rich or high-calorie dessert. 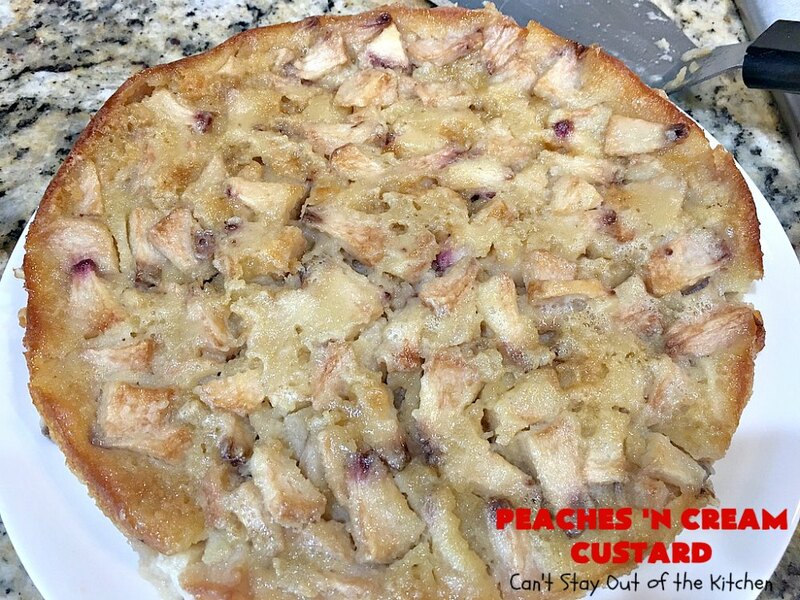 Peaches ‘n Cream Custard is really not a cake. 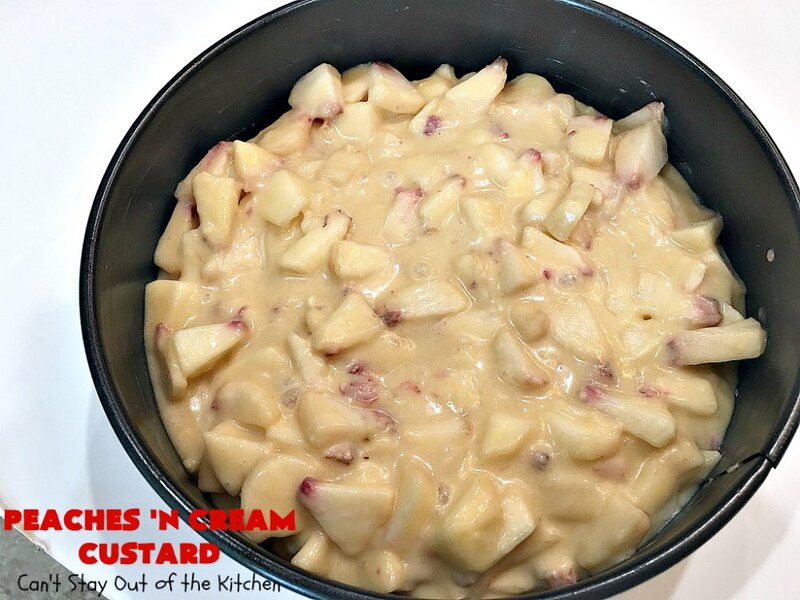 It’s a cross between a custard and pudding with just a little more body. 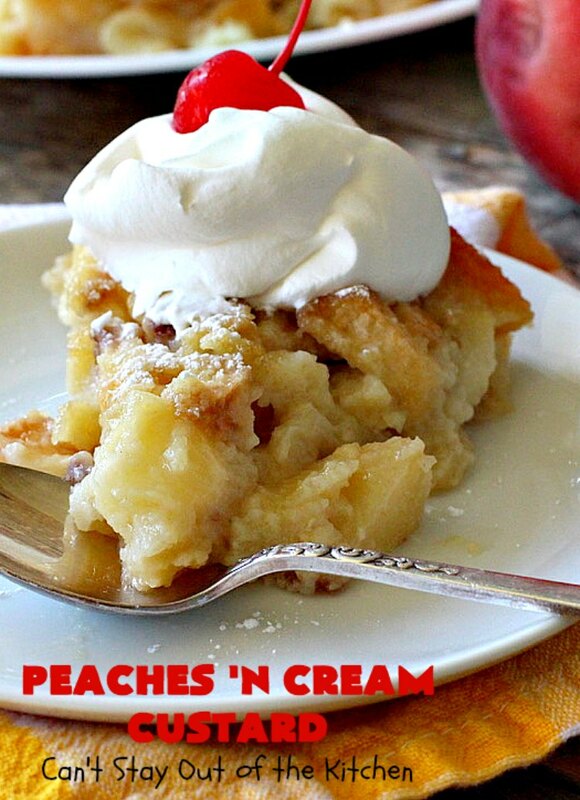 I enjoyed Peaches ‘n Cream Custard topped with Cool Whip and maraschino cherries. I used these ingredients. 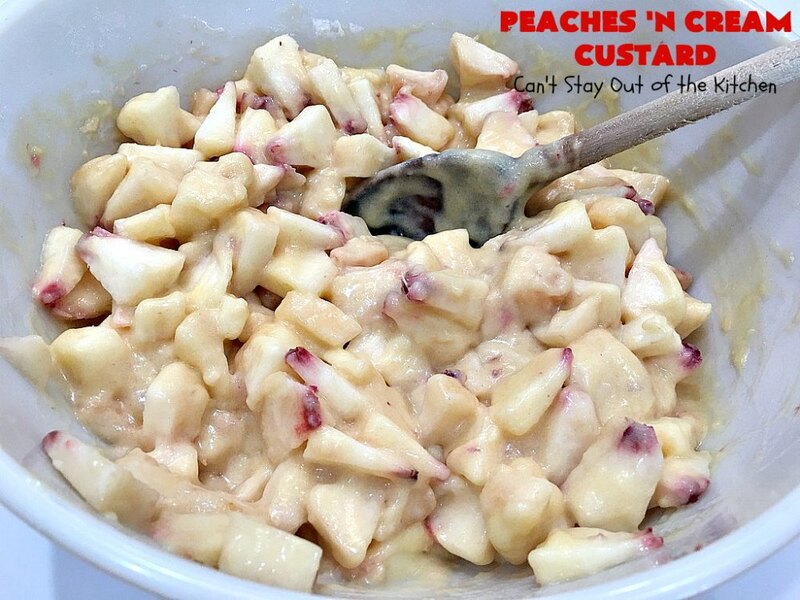 While I used white flesh peaches, regular peaches can also be used. 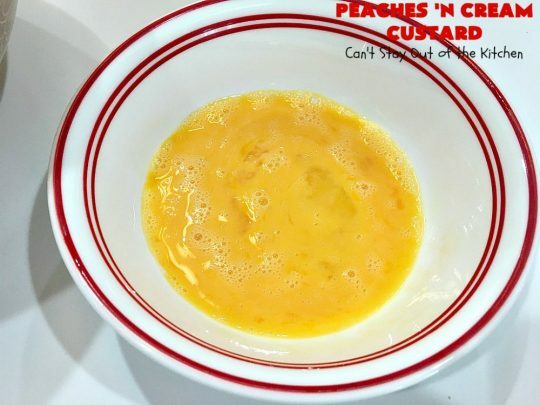 Beat a whole egg and an egg yolk in a mixing bowl. Set aside. 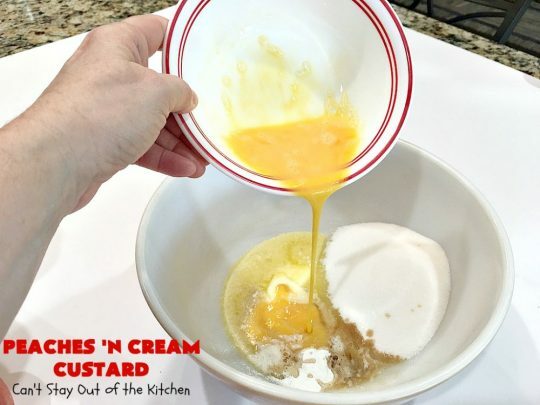 In a separate bowl, combine melted and cooled butter, sugar, vanilla and baking powder. Add UNBLEACHED all-purpose flour. Bleached flour toughens baked goods. Add half-and-half. 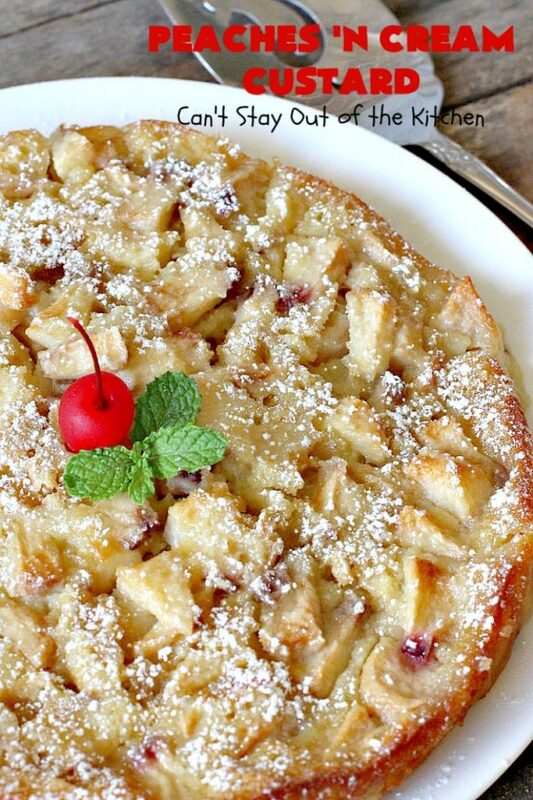 If you really want your dessert more cake like, add additional flour here. Grease a 9″ springform pan. Cut out parchment paper to fit the bottom and grease the parchment paper too. 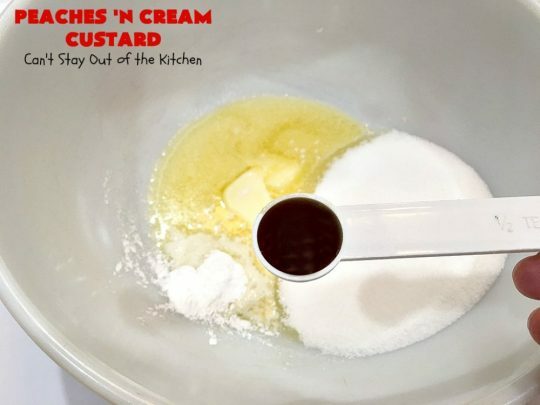 Pour custard mixture into prepared springform pan. Place springform pan on a cookie sheet to avoid any leaks. Bake at 350 for 50-60 minutes or until a toothpick inserted in center comes out clean. My dessert took one hour ten minutes to bake completely. Allow to cool completely before removing from springform pan. Remove to a plate and sprinkle with powdered sugar. We ate this dessert with and without Cool Whip. It was great both ways. The nice thing about this dessert was that it wasn’t overly rich. That’s why it’s really a nice dessert to make when you have a really heavy meal. Peaches 'n Cream Custard is a light, fruity and pudding-type dessert made with loads white flesh peaches. 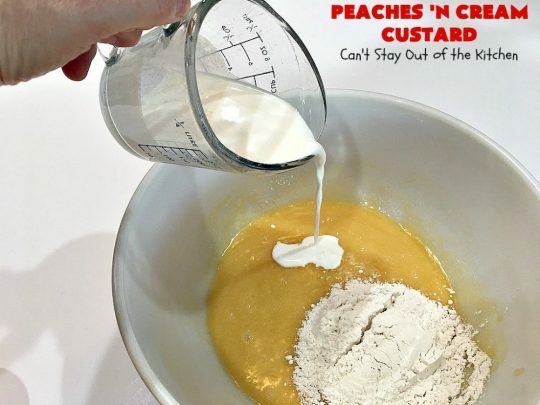 It's really more like a custard than a cake. 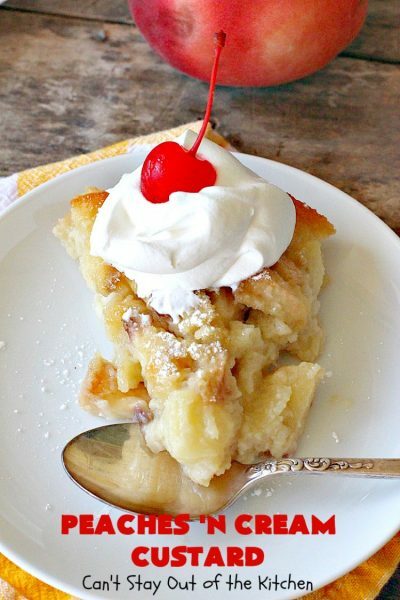 It's a terrific dessert to serve company after heavy meals because it's not overly rich or calorie laden. This dessert can be made with either fresh or canned peaches. If you enjoy fruity desserts, this one is calling your name! Grease a 9” spring form pan. Cover the bottom of the spring form pan with parchment paper. Grease parchment paper and sprinkle lightly with brown sugar. 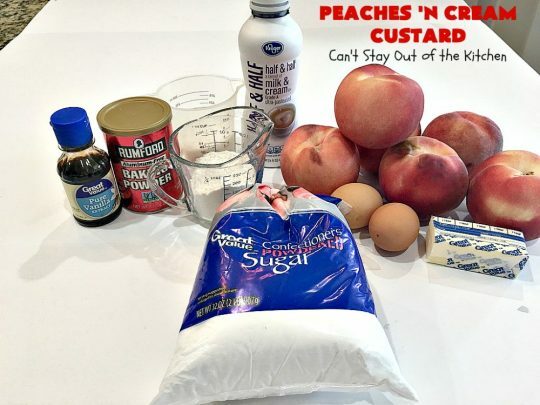 Peel and pit peaches and cut into small dice. Whisk eggs, sugar, vanilla, cooled, melted butter, and baking powder. Stir in flour and half-and-half. 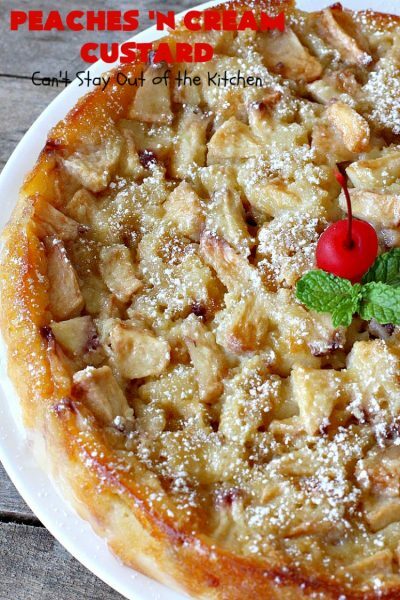 Bake at 350 degrees about 50-60 minutes or until a toothpick inserted in center comes out clean. Allow custard to cool completely. Run a knife around the outside of the spring form pan. Gently lift parchment paper off the bottom of the spring form pan. Place custard on a large plate. Sprinkle custard with powdered sugar before serving. NOTE: I omitted the brown sugar in the recipe. 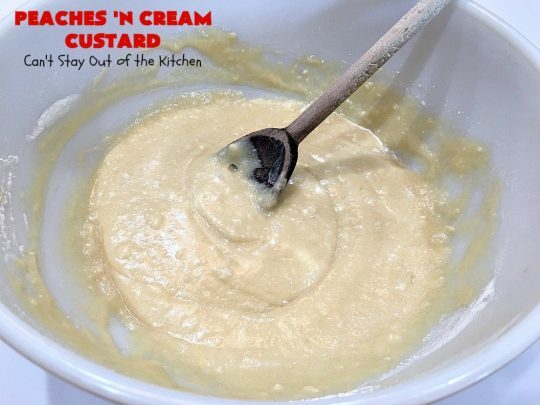 NOTE: My custard took 1 hour 10 minutes to bake completely. NOTE: I used 4 very large white flesh peaches. That yielded 5 cups diced fresh peaches for the custard. NOTE: I placed the springform pan on a cookie sheet to avoid leaking while baking. 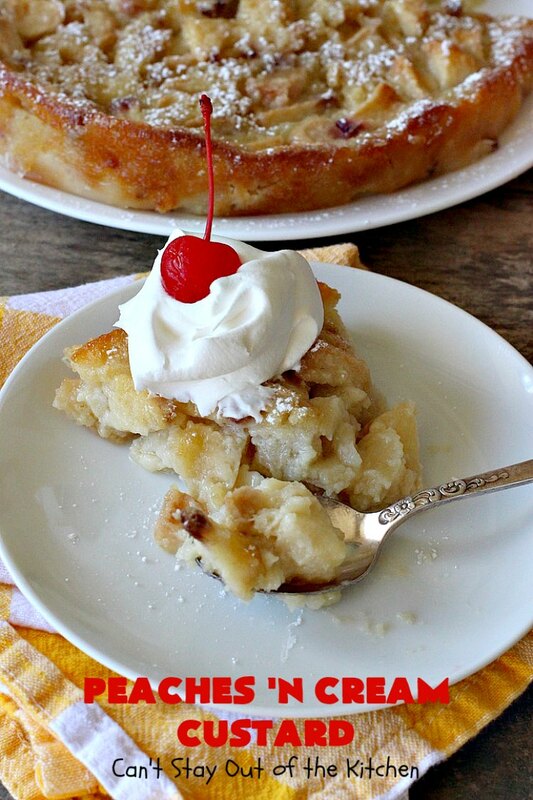 Recipe adapted from Seasons and Suppers. 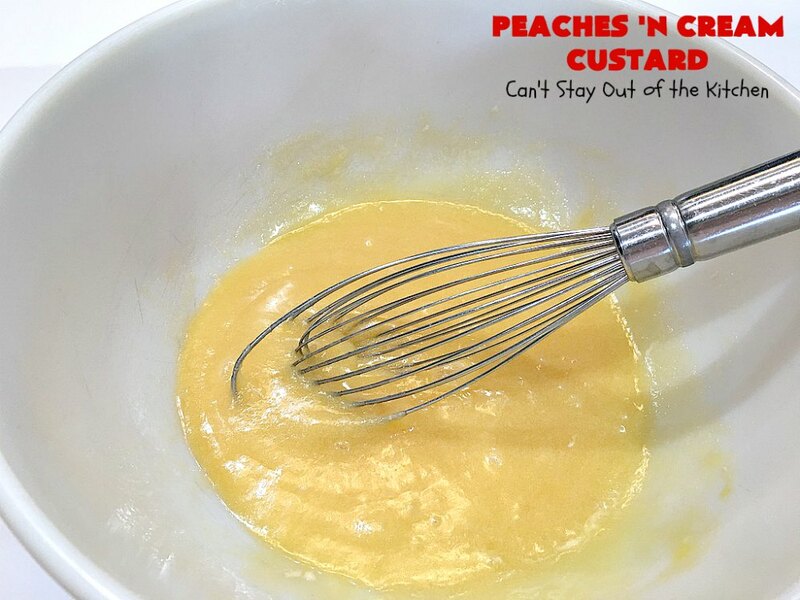 Peaches ‘n Cream Custard was really delicious. 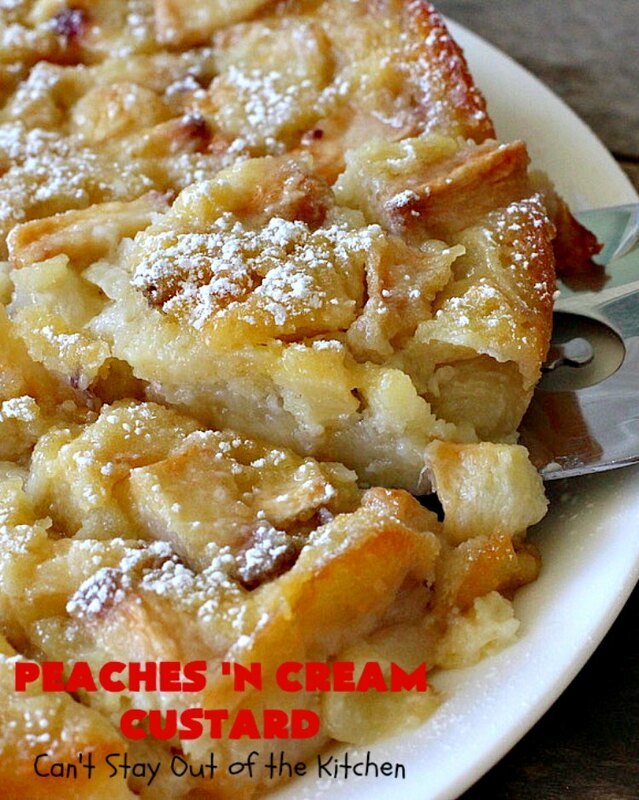 My husband and I really loved how many peaches were in this dessert. We drooled over every bite.